The Atago 3810 PAL-1 handheld, digital refractometer fits in many pockets, measures Brix in the 0.0 to 53.0% range and temperature 9.0 to 99.9 degrees C, has automatic temperature compensation (ATC), an external light interference (ELI) warning, and Ingress Protection (IP)-65 rating. A Brix refractometer measures the refractive index of a solution in a sample, converts it to sugar concentration in units of percent by weight (% Brix, also known as degrees Brix), and displays the results. Handheld refractometers, also known as sugar meters, concentration meters, or Brix meters, are commonly used in the culinary, food and beverage, pharmaceutical, educational, geological, chemical, and ecological industries, and for water-testing applications. This refractometer has a light (100g), compact body (10.9 x 5.5 x 3.1cm) that fits in many trouser and shirt pockets. The ergonomic design features curved sides to accommodate one-handed operation, and rounded edges to comfortably fit in pockets. The digital LCD displays values in three seconds. Automatic temperature compensation (ATC) provides immediate, accurate calibration readings, regardless of ambient temperature, and the device can be calibrated with water. High temperature samples can be measured up to 99.9 degrees C with ATC. An external light interference (ELI) feature displays a warning message when direct light is detected. The sample stage and well shape help prevent spilling. The body has Ingress Protection (IP)-65 rating for dust and water jets. It can be washed under running water. The 3810 PAL-1 comes with a plastic protective carrying case. Refractometers are used to determine substance content in a sample, to provide unit readings of substances including Brix, salinity, and alcohol; to detect chemical impurities, or to measure components of samples such as industrial fluid. Refractometers measure the refractive index of a substance, which is its optical characteristic, and the number of dissolved particles in it. The refractive index is the ratio of the speed of light in empty space to the speed of light in a substance; when light passes from one medium to another. Generally, a low concentration sample has a larger angle of refraction than a high concentration sample. For example, a straw placed in a high-concentration substance appears more bent than when placed in a low-concentration substance. Refractometers can work with natural light, or with an external power source such as batteries or electricity. They typically have either a digital or analog reading display, though some units utilize both types. Some analog-display refractometers can be used for both solids and liquids. Digital-display refractometers are used exclusively for liquids. Types of refractometers include handheld, benchtop, and in-process. Handheld refractometers are elongated and telescope-shaped, or shorter and rectangular. Analog handheld refractometer readings are obtained by looking through the monocular eyepiece and viewing where the boundary line intersects with the memory line. Digital handheld models provide a digital readout. Benchtop refractometers typically measure with a higher degree of accuracy than handheld units. In-process refractometers are used for continuous process monitoring and data readouts, and are generally fitted into a piping system for ongoing analysis. Refractometers are used in a wide variety of applications in the culinary, food and beverage, pharmaceutical, educational, geological, chemical, ecological, and automotive industries, and for water-testing applications. 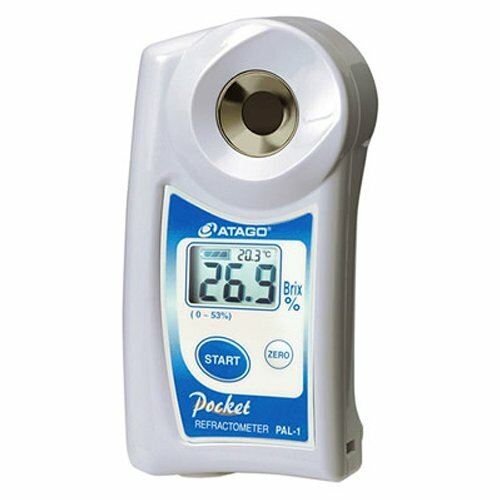 Atago Co., Ltd. manufactures analytical instruments such as refractometers, polarimeters, and saccharimeters, as well as a variety of meters. The company, founded in 1940 and headquartered in Tokyo, offers products that comply with Hazard Analysis and Critical Control Points (HACCP), Good Manufacturing Practices (GMP), and Good Laboratory Practices (GLP) system standards, and many International Organization for Standardization (ISO) standards. If you have any questions about this product by Atago, contact us by completing and submitting the form below. If you are looking for a specif part number, please include it with your message.